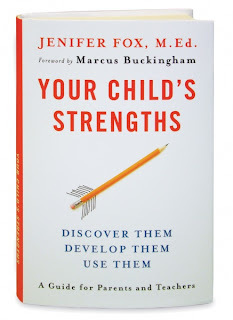 For the past few weeks I have been reading a great book by Jenifer Fox called Your Child’s Strengths. In the first few pages of this book, Jenifer captured my attention as she describes one of her earliest moments in school. The point in time that she realized that she had a talent inside of herself. She speaks about her academic experiences, not just as a pupil, but as a current educator. Looking back on the way she was taught, the subjects covered and her feelings of weakness when she did not excel at everything. We both believe the same things. Not everyone can be good at everything, so find what you do well and develop it to it’s highest potential. As a principal, she wonders why the current school system teaches trigonometry, when what we probably need is statistics or why students need to learn Romeo and Juliet, when they could be learning about their local community and where its resources come from. Jenifer questions most conventional methods of teaching kids, wondering if a new model needs to be developed in order to bring the excitement of learning back to the educational system. I recommend this book to all parents and teachers because not only does it describe ideas and practices that contribute to children feeling weakness, but she goes on to explain what strengths are and how and why families and schools should help children develop theirs. The last section of the book offers a variety of workbook exercises that parents, teachers, or children can use to discover and develop their strengths.